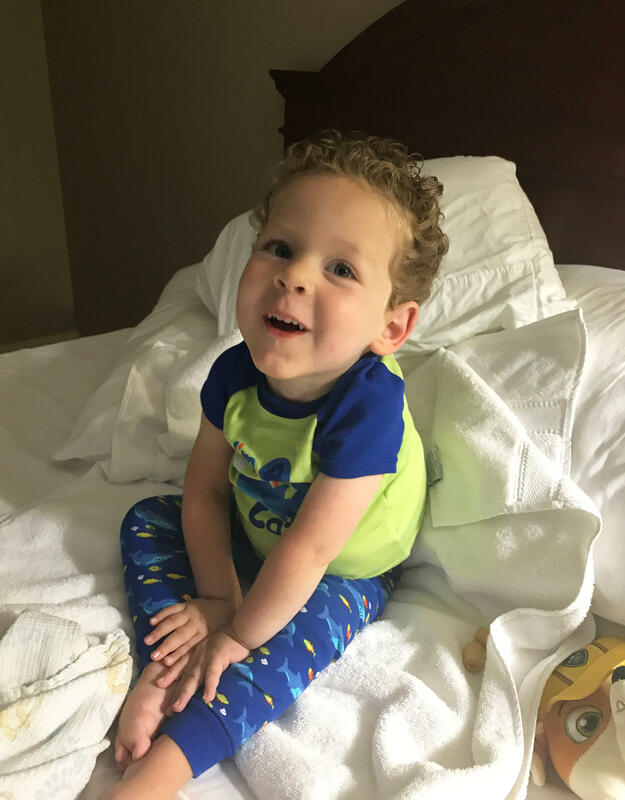 Eli Wheatley, 3, of Lebanon, Ky., was diagnosed in his first few weeks of life with spinal muscular atrophy, a genetic disease of motor neurons that was destroying his muscles. Thanks to a single infusion of experimental gene therapy, his mom says, she continues to see improvement every day. 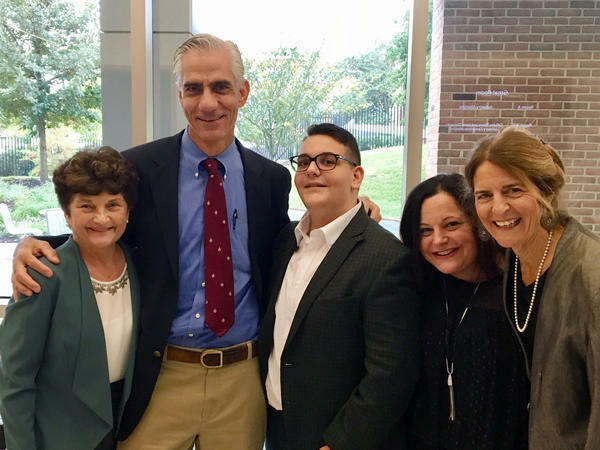 (From left to right) Kathy Marshall, research coordinator, Dr. Albert Maguire, the ophthalmologist and surgeon who performed the gene therapy surgery, Christian Guardino, Beth Guardino and Dr. Jean Bennett. Christian now says he's able "to see stars for the first time — fireworks — all these amazing things that I've never been able to see before." Eli Wheatley and Christian Guardino are among a growing number of patients whose lives are apparently being saved or radically improved by gene therapy. Wheatley, 3, of Lebanon, Ky., and Guardino, 17, of Patchogue, N.Y., were both diagnosed with what were long thought to be incurable genetic disorders. In the past, Wheatley's condition would have probably killed him before his first birthday. Guardino's would have blinded him early in life. But after receiving experimental gene therapies, both seem to be doing fine. "It's a very exciting time for the field," says Carrie Wolinetz, the associate director for science policy at the National Institutes of Health. So far, gene therapy has only been tested on a relatively small number of patients who have been followed for relatively short periods of time. Many more patients will have to be studied for longer periods before anyone really knows how well the therapies work, how long the benefits last, and whether the therapies are safe. But doctors and families of those helped so far are elated at the progress. "This is really an important time in gene therapy," says Dr. David Williams, professor of pediatrics at Harvard Medical School and chief scientific officer at Boston Children's Hospital, who was not involved in these children's treatment, but has recently achieved similar success with another genetic condition. Eli's mother, Natalie Wheatley, had been terrified there was something wrong with Eli even before he was born. He barely moved during her pregnancy, she recalls, and never seemed quite right in the first weeks of his life. Finally, doctors told her that her worst fears were true: Her son had spinal muscular atrophy, a disease of motor neurons that was destroying his muscles. "They basically told me he wouldn't make it to his first birthday," says Wheatley. Take him home and love him and spend as much time with him as you can, she remembers the health team telling her. "I was devastated — devastated," she says. Guardino was diagnosed with a different condition — Leber's congenital amaurosis, a disease of the eye's retina — when he was born. The disorder isn't fatal. But it was destroying his vision. "I wouldn't be able to walk around outside on my own," says Guardino. During the day, he says, the world looked "incredibly dark" and blurry. "It was sort of like watching your world fade away." Now Guardino can see things he'd only dreamed about. After the gene therapy treatment, he says, "I was able to see things for the first time — like the moon. I was able to see stars for the first time – fireworks — all these amazing things that I've never been able to see before." And Wheatley's son, Eli, seems to be thriving. "He just started preschool in September," his mom says. "He goes to preschool alone. He eats in the cafeteria with all the other kids. He's doing extremely well. It's been amazing — truly amazing." Recent success in these different cases "really shows us we're able to harness this therapy for some pretty terrible diseases," says Williams, who reported last month in the New England Journal of Medicine that gene therapy can also halt the progression of disease in boys suffering from adrenoleukodystrophy, a fatal genetic brain disease made famous by the movie Lorenzo's Oil. Scientists thought this sort of success would come decades ago. But their first attempts to save people born with defective genes by giving them new, healthy genes fizzled. Some patients who volunteered for early experiments developed cancer. At least one person died. "And that caused a setback in the field, which caused a lot of concern that maybe gene therapy was not ready for prime time," the NIH's Wolinetz says. Some scientists feared gene therapy might never work. Researchers went back to the drawing board to come up with better, safer ways to use viruses to deliver healthy genes into a person's body. It's those decades of research that finally seem to be paying off. "We have reached a point of maturation in the science and in some of the new approaches to gene therapy that have allowed us to make rapid advancements in a fairly short period of time," Wolinetz says. The price tag of such a treatment remains a looming question. The first gene therapy product approved by the Food and Drug Administration (a treatment for a form of leukemia, approved last summer) costs hundreds of thousands of dollars for each infusion. Some drug industry analysts predict the next gene therapy could cost close to $1 million per patient. Dr. Peter Bach, director of the center for health policy and outcomes at Memorial Sloan Kettering Cancer Center, says he's thrilled with the scientific progress that's been made in the field — but the cost of gene therapy drugs troubles him. "The model by which every innovation is turned around to extract the maximum amount of profit is ultimately taking away our ability to adequately fund many other things that promote health," Bach says. Whatever the questions and costs, people who have been helped by these treatments so far seem delighted. "I think that the gene therapy is a miracle," Guardino says. "I can't imagine what my life would be like without it." Natalie Wheatley, whose son Eli was among those described in another study, published early this month in the New England Journal of Medicine, says her son seems to continue to improve. "I see progress every day," Wheatley says. "So that, to me, offers hope that gene therapy has saved his life. And I think eventually gene therapy will give the world hope. That's my hope anyways." The FDA could soon approve for non-experimental use the first gene therapy for a genetic disorder — the treatment Guardino received to save his vision. Meanwhile, scientists are starting to test other forms of gene therapy for a long list of other diseases, including many that are much more common. Now we have a story about the power of science to heal. 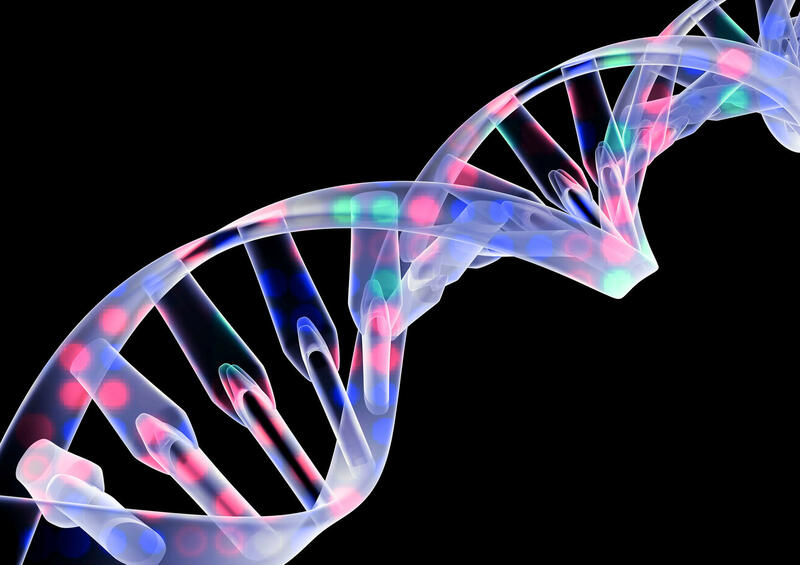 For decades scientists have been dreaming about curing diseases with gene therapy. Those dreams have not become reality, but there's growing excitement now. NPR health correspondent Rob Stein reports. ROB STEIN, BYLINE: Natalie Wheatley was terrified there might be something wrong with her baby even before he was born. He barely moved during her pregnancy, and after he was born, doctors told her her worst fears were true. He had a terrible incurable genetic disease that was destroying his muscles. NATALIE WHEATLEY: Basically told me he wouldn't make it to his first birthday, take him home and love him and spend as much time with him as you could. And I'm going to be honest with you. I was devastated, devastated. STEIN: When Christian Guardino was born, he was also diagnosed with a rare genetic disease. His wasn't fatal but was destroying his vision. CHRISTIAN GUARDINO: I wouldn't be able to walk around outside by my own. It would be incredibly dark, blurry and sort of watching your world fade away. STEIN: But Wheatley's son, Eli, is still alive. He's now 3 and seems to be thriving in Lebanon, Ky.
WHEATLEY: He just started preschool in September. He goes to preschool alone. He eats in the cafeteria with all the other kids. He's doing extremely well, extremely well. It's been amazing. Truly amazing. STEIN: And Christian Guardino, who is 17 and lives in Patchogue, N.Y., can now see things he only dreamed about. GUARDINO: I was able to see things for the first time, like the moon. I was able to see stars for the first time, fireworks and all these amazing things I've never been able to see before. STEIN: Eli Wheatley and Christian Guardino are among a growing number of patients whose lives are being saved or radically changed by gene therapy. DAVID WILLIAMS: This is really an important time in gene therapy. STEIN: That's David Williams. He's a Harvard scientist who recently reported that gene therapy could cure kids suffering from yet another awful genetic disorder, the fatal brain disease made famous by the movie "Lorenzo's Oil." WILLIAMS: It really shows us that we're able to harness this therapy for some pretty terrible diseases so that's just great. STEIN: Scientists thought this would happen a long time ago, but the first attempts to save people with defective genes by giving them new healthy genes fizzled. And Carrie Wolinetz of the National Institutes of Health says some volunteers in early experiments ended up getting cancer. Some even died. CARRIE WOLINETZ: And that caused a setback in the field which caused a lot of concern that maybe gene therapy was not ready for prime time. STEIN: And may never be. But scientists went back to their drawing boards to come up with better, safer ways to deliver healthy genes into people's bodies, and that finally seems to be paying off. WOLINETZ: I think we have reached a point of maturation in the science and in some of the new approaches to gene therapy that have allowed us to make rapid advancements in a fairly short period of time. So it's a very exciting time for the field. STEIN: Now, gene therapy has still only been tested on a small number of patients for relatively short periods of time. A lot more patients will have to be studied for a lot longer before anyone really knows how well it works, for how long and whether it's really safe. Another big question is the price tag. These new gene therapies cost hundreds of thousands of dollars, perhaps even a million dollars for each patient. And Peter Bach of Memorial Sloan Kettering says that's just too much. PETER BACH: Gene therapies, we've been hearing for years that they were going to be a million dollars before we had any product. So now when they come out, everyone's like, well, we expect them to be a million dollars, simply because it's been repeated so much. STEIN: Whatever the questions and cost, people who have been helped by gene therapy are just thrilled. Here's Christian Guardino again, the teenager who regained his vision. GUARDINO: I think that the gene therapy is a miracle, and I think I can't imagine my life without gene therapy. I can't imagine what my life would be like without it. STEIN: Natalie Wheatley, whose son, Eli, got gene therapy says he keeps getting better. WHEATLEY: I see progress every day. I see progress every day so that to me offers hope that, you know, gene therapy has saved his life. And I think eventually gene therapy will give the world hope. That's my hope, anyways. STEIN: The Food and Drug Administration could approve the first gene therapy for a genetic disorder soon, the one Christian got to save his vision. Meanwhile scientists are starting to test gene therapies for a long list of diseases including many that are much more common. Rob Stein, NPR News. Transcript provided by NPR, Copyright NPR.